This species is close to V. umbrabdomina Huang et Zhou, but in full face view, occipital margin weakly concave in the middle; anterior clypeal margin strongly convex; in profile view, propodeal spines weakly curved down backward, and distinctly longer than propodeal dorsum; postpetiolar node evenly convex. Xu ZH, Yu NN. 2012. 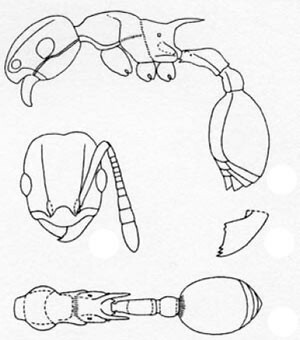 Vombisidris tibeta, a new Myrmicine ant species from Tibet, China with a key to the known species of Vombisidris Bolton of the world (Hymenoptera: Formicidae). Sociobiology. 59: 1495-1507.